Anyone who knows my family knows that we spend a great deal of time at the Janeway. With Brennen's surgeries (see HERE and HERE), regular therapy sessions and specialist appointments (in addition to caring for other children who have significant medical needs), we have become frequent fliers of our local children's hospital. I have written many times about our connection to the Janeway (ie. HERE and HERE), and am always happy to share our experiences and to give thanks to the wonderful medical staff who have cared so well for my family. 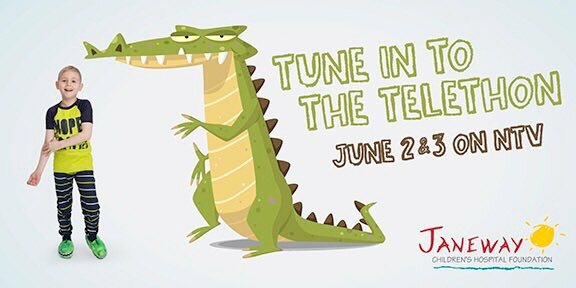 A couple of months ago, I received a lovely phone call from our dear friends at the Janeway Children's Hospital Foundation, asking if Brennen would be interested in being part of the Janeway Imagine Squad. The Imagine Squad aims to highlight the power of imagination, and features several Janeway kids pretending to interact with their imagination, represented through illustrations that were added to the photos afterwards. I was so excited when we got the call! I know how creative young minds can be, and how their curiosity drives them to explore their world and learn about everything around them. This creativity can be dampened when children are sick, or must spend endless days in a hospital bed. Every child's imagination needs to be stimulated, and when children are unwell or are going through a tough time, the bad stuff needs to be balanced with good experiences and positive images so that they can escape in their minds into a fascinating alternative world. The ability to move from reality to fantasy and back again comes easy to children, and this ability to lose yourself into another world is an asset when the real world can be difficult or depressing. Sara Rostotski was the official photographer for this campaign and the creative team at The Idea Factory brought the images to life! Many of the photos taken during this shoot will assist in building awareness of how important the Janeway Children's Health and Rehabilitation Hospital is to all of our province's children. Here is Brennen, imagining himself floating through outer space - weightless and free from the constraints of his wheelchair. There is no pressure on his body or pain in his joints from continuous sitting. He is ready for all sorts of fun space adventures! Adorable Asha and Kaleb are also part of the Imagine Squad. 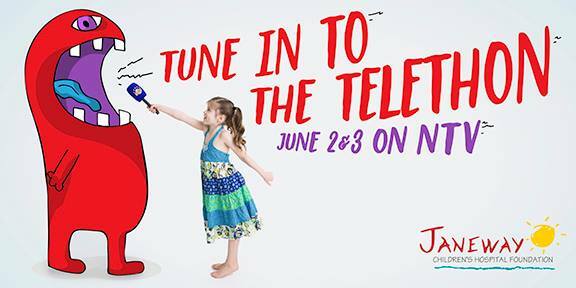 Each child has their own Janeway story and we are excited for you to see them in the coming weeks leading up to the Telethon. 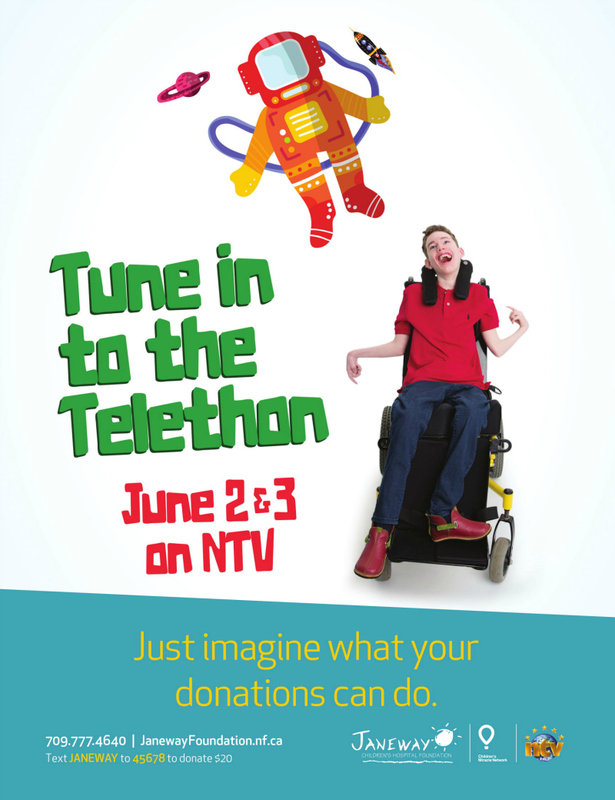 Keep an eye out for these images on billboards and in print media around town, and make sure you tune in to the Telethon on June 2nd and 3rd to witness the real impact the Janeway has on the lives of so many children in our province. Just imagine what your donations can do! This past September, I attended a Brainstorming Event: "Working Together to Promote Participation", held in Montreal (see HERE). Our discussion focused on the best ways to promote leisure participation of children with disabilities and to engage families in the community. The meeting was hosted by the Jooay Team, lead by Dr. Keiko Shikako-Thomas, Canada Research Chair and Assistant Professor at the School of Physical and Occupational Therapy of McGill. "Participating in sports and other leisure activities is an important part of childhood development; however, accessing appropriate activities and information is a challenge for children with disabilities. We created "Jooay", a mobile and web-based app, to provide families with information about appropriate leisure activities available in communities across Canada." The Jooay App was launched in Spring 2015 to overcome the lack of access to information about inclusive leisure activities, and to create an online community of support through a mobile-health solution. 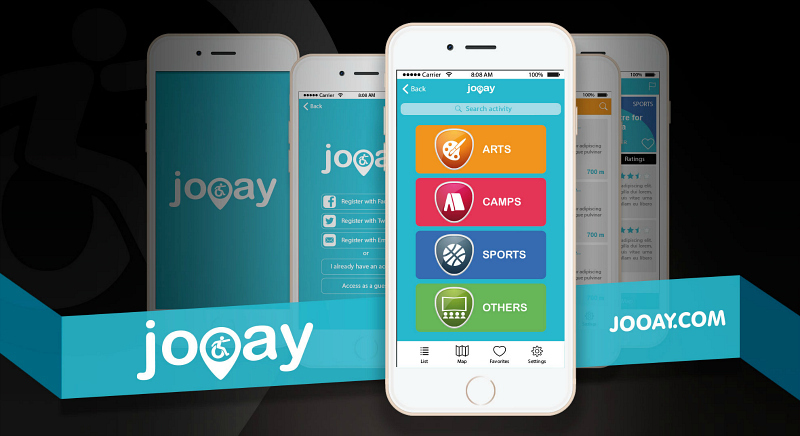 Jooay is an App where parents, youth and other users can exchange information, rate and comment on activities, creating a community and building networks around adapted and inclusive leisure opportunities. Participation in sports and other leisure activities is critical to the physical and mental health of all children, and essential to their social development. However, it has been found that engagement in leisure activities is low for children with disabilities compared to peers of the same age, both in terms of frequency of participation and diversity of recreational activities in which they partake. Families, healthcare professionals and educators have indicated that the lack of information about existing resources is a significant barrier to children’s participation and that a peer mentorship program could help facilitate this process. To address this issue, the Jooay App was created by Dr. Keiko Shikako-Thomas and Dr. Annette Majnemer, faculty members at the School of Physical and Occupational Therapy at McGill University. I believe that participating in recreation and leisure activities is important to all individuals, regardless of ability. It is not only important in maintaining fitness, but it is also a means through which people have fun, meet new friends, and develop skills and competencies. As a parent of two children with disabilities, I also know how challenging it can be to find activities that allow my children to get involved and have fun. My son, Brennen has been involved in a number of adapted recreational programs over the years, and while our goal, always, is to provide him with meaningful life experiences and encourage social interaction, having him involved in sport and other extracurricular activities has increased the quality of life for our whole family. I am now the Jooay Ambassador for Newfoundland and Labrador, and will be working collaboratively with the Jooay Team to help identify adapted leisure activities, to provide information about Jooay and adapted activities to children and families in our region, and to actively help promote participation for children and youth with disabilities across Canada. Please contact me if you would like more information on the Jooay App, or if you know of an inclusive or adapted activity that can be added to our database. I would love to hear from you! This project is part of the Child-Bright Network: A Canada-wide, patient-centered research initiative, including 12 research projects to improve the life conditions of children and youth with brain-based disabilities and their families.